What I am trying to find is the equivalent (where appropriate) of the same data for various countries. Is there any free administrative boundaries available as shapefiles for other countries? For non-commercial use, try GADM. OpenStreetMap has a lot of data. It isn't necessarily authoritative, but if you are just trying to get data it may be suitable. The UN has a dataset for many (but not all) countries, known as the Second Administrative Level Boundaries data set project (SALB). The dataset is standardized in terms of the international border, metadata profile, spelling, coding scheme, editing protocols used and can be downloaded at no cost. However, as it is licensed under the creative commons by-nc-nd license it cannot be used for commercial purposes. Country boundaries should be produced by merging all the state boundaries (below) into a single polygon feature. State level boundaries are available. The states can be geographically disaggregated in a number of ways - perhaps the most similar to county boundaries are Local Government Areas (LGAs). To find the area of cities, the standard dataset to use is the urban centres and localities digital boundaries. Zipcodes (or postcodes as they are known here) are more difficult to model. Because they are based on the rules by which Australia Post deliver the post, they are rather fuzzily defined. The free option approximates postcodes as the census collection district level, and is available for 2006 from the ABS. the updated 2011 datasets and census results are available via the Data Packs section of the ABS site, which requires free registration. Administrative Boundaries are available at GeoBase. Note that these boundaries are actually Administrative Boundaries and not coastlines (particularly relevant for the north coast). The Political Boundaries layer in the GeoGratis North American Atlas has nice physical boundaries for North America and surroundings, as well as U.S. States and Canadian Provinces. The Boundary-Line dataset has a number of administrative boundary layers (though why they couldn't provide a simple, continuous, GB county boundary dataset in it is beyond me). However, there's a lot of good stuff on this site, including a GB post code gazetteer. New Zealand: Koordinates - This site has free and pay data for New Zealand and various international areas (like Florida!). A range of free layers, boundaries, urban areas, land use, digital elevation, coastline, rivers etc... and topo maps, contours, aerials for some areas - pay for these. Excellent interface and system for ordering downloads. Also for New Zealand, http://www.stats.govt.nz/browse_for_stats/people_and_communities/Geographic-areas/digital-boundary-files.aspx is the Statistics Department's set of administrative boundaries. They've got regions and territorial authorities (the rough equivalent of counties), urban areas (roughly city boundaries) and much more, including meshblocks, which most statistical data is tied to. Finally, scroll to the zip download, which is among the Transfer Options links. The following links are to sources of geo-spatial data and is intended for the use of researchers who cannot afford to buy expensive datasets. Hence, all the datasets are either free or cost under £50.00. Whilst we have included low cost data, it is not our intention to advertise or support companies selling commercial data. Please note the specific licensing restrictions to the data, as specified. In general the data is for non-commercial use only. Boundary-Line is a specialist 1:10 000 scale boundaries dataset. It contains all levels of electoral and administrative boundaries, from district, wards and civil parishes (or communities) up to parliamentary, assembly and European constituencies. Geofabrik provides you with geodata that matches your needs. We mainly work with free data from the OpenStreetMap project and use the lean OpenStreetMap tools for cartography of all kind. Our download server has free and current geodata from OpenStreetMap in various formats. 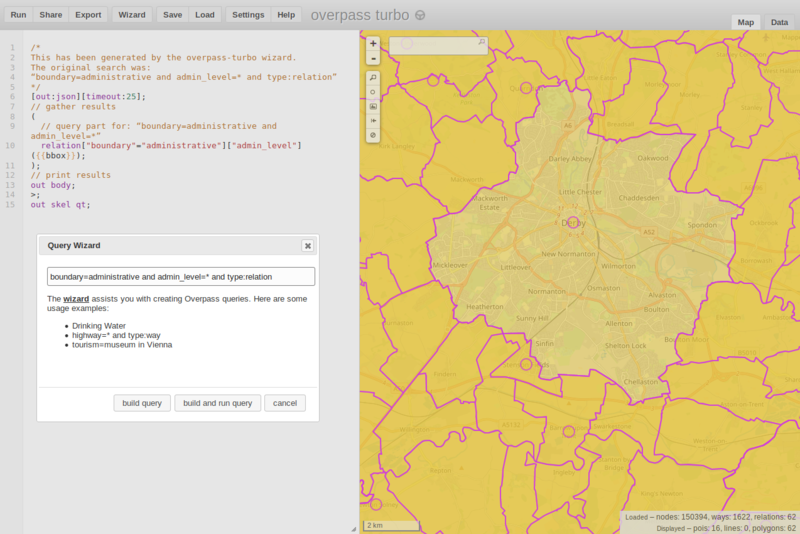 You could also use the OSM Overpass API (as a web-based tool: https://overpass-turbo.eu/) to query OSM data and export it. http://www.fao.org/docrep/008/a0118e/a0118e05.htm has a decent comparison I recently stumbled across. Note that VMAP0 seems to be the standard and is widely considered to be freely licensed, but there's actually a little asterisk that asserts the administrative boundaries remain copyright ESRI 1998. Several supposedly libre online datasets seem to point back to that vintage of ESRI data CD. NSPD > It now has Northern Ireland Postcodes (BT Postcodes) that can be also be used. BoundaryLine has most of the boundaries you are looking for. If used please state: This data contains Ordnance Survey data © Crown copyright and database right 2010. Code-Point Open contains Royal Mail data © Royal Mail copyright and database right 2010. The NSPD Open also contains National Statistics data © Crown copyright and database right 2010. The Census geography boundary hierarchy is really good for small area UK work and freely available, either by order directly from the Office for National Statistics or as download from Data.gov.uk. It comprises of Output Areas, Lower-layer Super Output Areas, Middle-layer Super Output Areas (roughly 10,000 population, broadly equivilent to electoral wards). Outputs from the ONS, government departments & agencies use these divisions as standard now rather than administrative boundaries that are prone to political reorganisation and not so uniform in population size. This website seems to be perfect for what I need right now. Later on I can look up licensing for postcodes in the UK and elsewhere. Commercially GfK geomarketing has a good quality of data available in differetnt formats. In Europe they are specilized in postal code maping. The "Large Scale International Borders" and other datasets provided by https://hiu.state.gov/data/data.aspx?view=table&sort=title+asc# (The US Department of State, Humanitarian Information Unit) are quite good for continent-wide overview maps. "Unita' amministrative regionali, provinciali e comunali"
Access constraints requires "Formal permission to do something"
Not the answer you're looking for? Browse other questions tagged data global or ask your own question. Finding municipal-level administrative boundary data for India? Seeking municipal-level administrative boundary data for Poland? Where can I find spatial data for UK administrative boundaries? Seeking up to date Italian administrative boundaries? Where can I find a dataset for international borders that includes national waters? Seeking free, publicly available GIS data for Singapore? Seeking vector data of agricultural field boundaries in small area of south west England? Seeking Free Shapefile of European Countries? Where can I find UK boundary data shapefiles where features have attributes pointing to their parent subdivision?